An air source heat pump is a highly efficient heating and air conditioning systems that can deliver one to three times more heat than the electricity they consume. Their efficiency stems from their ability to move or transfer heat from the air versus traditional systems, which must convert it from a fuel source. Installation of an air source heat pump on average will cost between $3,700and $5,200 per indoor air source heat pump unit needed. A brand new central heat pump system can cost between $14,000 and $22,000. Until recently, air source heat pumps were used primarily in the southern regions of the United States. However, advances in the technology have allowed the systems to offer a viable space-heating alternative in colder regions of the country versus electric resistance and oil heat systems. It must be noted that an air source heat pump works in conjunction with an oil burning heating system. Because the air source system assumes some of the heating load, the oil system operates less frequently which increases overall efficiency and reduces energy consumption and costs. Ductless air conditioner systems offer broad versatility, as they require zero ductwork. A simple, three-inch hole bored through an exterior wall is the only home modification required. The hole is necessary to provide access for the copper suction lines, drain line and wiring between the two components. Ductless systems are ideal for room additions and garage applications where a separate heating or cooling system might be desirable. They also offer a convenient way to increase or supplement existing heating and cooling in areas of your home that may be lacking. A ducted air source heat pump incorporates a circuit of air ducts and vents that circulate and transport conditioned air throughout the structure and back to the system. Ducted systems are most often used in new construction or when replacing outdated equipment in homes that already have a duct system in place. Split air source heat pumps are described as having both an interior and exterior coil. The air handler houses the interior evaporator coil while the exterior condensing coil surrounds the heat pump compressor. Packaged systems are simply those units that incorporate a single housing for both the evaporator and condensing coils as well as the fan or blower assembly. A simple explanation to describe a multi split air conditioner vs a single split AC zone system can be found here. Single zone systems rely on one outside condensing unit and one inside evaporating unit, which is referred to as a head. These air source heat pump systems are ideal for single applications such as room additions, garages and workshops. Multi zone systems are those systems capable of supporting several inside heads with a single condensing unit outside. These systems are installed in homes to provide heating and cooling versatility. A multi-zoned system allows the user to cool specific areas of the building instead of the entire space. This can reduce energy consumption and lead to significant savings on your monthly utility bill. Traditional air conditioning systems rely on electrical resistance heating elements to warm the air. This is not the case with an air source heat pump system, which uses a much more energy efficient means to produce the heat. When the temperature drops, a programmed thermostat calls on the system to produce heat. The system powers on and liquid refrigerant begins to pass through the condensing coils absorbing heat from the outside air. The refrigerant then converts or evaporates into a gas. It is possible to draw heat from outside air even during the cold winter months. Once the gas travels through the system and back to the inside evaporator coil, the heat is released and the gas is converted back into a liquid refrigerant and returns to the condensing coil where the whole process starts over. The system uses a fan and blower assembly to distribute the conditioned air throughout the home. As fresh air is drawn back into the system through its return vent, it passes through the evaporator coil where it is reheated. The process is repeated continuously until the desired comfort levels are met. 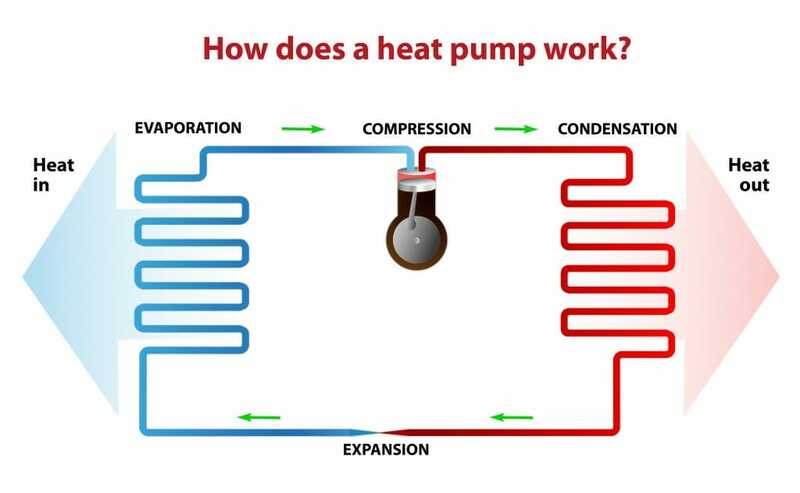 A heat pump system is also capable of cooling by utilizing a reversing valve that changes the direction of the refrigerant flow. The reversing valve is also used as a means to defrost the condensing coils during the winter months when necessary. Place the condensing unit away from areas around your home, such as bedroom windows and patios where its operation could produce noise and create a problem. Keep in mind when placing your condensing unit it should be in a protected area away from high winds which could negatively affect its defrost cycle. Only hire licensed and insured HVAC contractors to install your system. Ask for references and follow up by contacting the Better Business Bureau to inquire about any complaints.